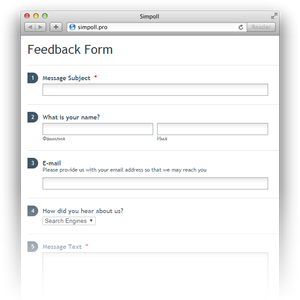 Add feedback form to «Contacts» page of your site. Spare your visitors from necessity to open their mail client to write you. Using «Logic control» function you can set various e-mail addresses for sending of form, depending on how it was filled. In addition, you can offer to fill several fields with answer variants to arrange a mini-survey. Simpoll will help you to learn the most frequently chosen variants. Conduct marketing researches quickly and easily. Create a survey for your consumers! You can use our survey template or supplement it with your own fields if necessary. 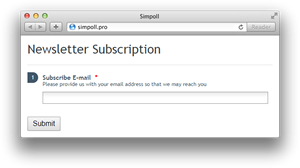 With Premium Plans you can remove Simpoll’s logo or replace it by your own one. 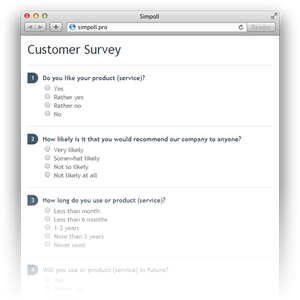 Simpoll will process the results online, helping you to draw right conclusions and to enhance your products and services. Searching for new employees? 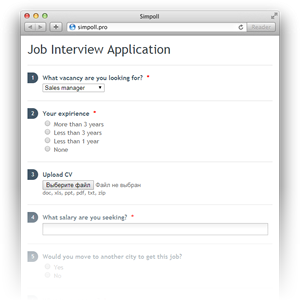 Let your potential applicants send you curriculum vitae directly from your site. Curriculum vitae can be attached using the field for upload of files. All uploaded files can be viewed in one list. No need to look through your e-mail inbox, when searching for curriculum vitae. Using our filter system you can export applicants to Microsoft Excel by specific vacancy or all together. Let the visitors of your site leave their e-mails for subscription to your newsletter. You can export the list of all collected e-mails to Microsoft Excel to use them with your preferred mailing service. Do you develop new projects? Make it easy for your visitors to inform you on any detected errors with attached screenshots using feedback form on your site. Do not waste your time on collecting error reports. Focus yourself on their correction! 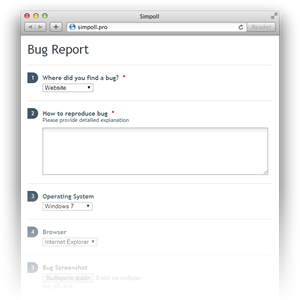 Using filters and reports of Simpoll you can easily detect any flaws of your project and eliminate them.